Higher National qualifications provide practical skills and theoretical knowledge that meet the needs of employers. 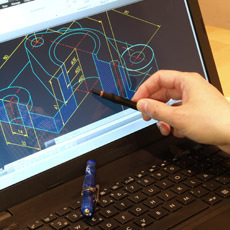 The HNC and HND Computer Aided Draughting and Design give learners the opportunity to develop the practical skills and underpinning knowledge of CAD, the design process and wider engineering technology. The Computer Aided Draughting and Design qualifications are available through colleges. Typically, an HNC takes one year to complete and an HND takes two years. The HNC Computer Aided Draughting and Design will develop a comprehensive level of knowledge and practical skills in traditional CADD topics, as well as the more advanced features of modern software. The candidate will also develop knowledge and understanding of the design process, and of how CADD can help in achieving a desirable design solution. The HND Computer Aided Draughting and Design is designed to meet the demands of employment in engineering, construction and design related industries. It will provide you with a range of contemporary vocational skills including the preparation, co-ordination and communication of technical information (including drawings, graphical information, reports and schedules); contributing to meeting relevant statutory regulations and controlling projects by monitoring agreed standards; and obtaining, recording and organising information. Learners who achieve an HNC Computer Aided Draughting and Design can progress to the HND. The HND Computer Aided Draughting and Design can provide progression to degree-level study. Assessment support packs are available for the mandatory units within the HNC and HND. HNC Computer Aided Draughting and Design at SCQF level 7 consists of seven mandatory units (64 SCQF credit points) and four optional SQA credits (32 SCQF credit points). HND Computer Aided Draughting and Design at SCQF level 8 consists of 15 mandatory units (168 SCQF credit points) and a number of optional units (72 SCQF points). The finishing date for this qualification is 31/07/2019 (HNC) and 31/07/2020 (HND).